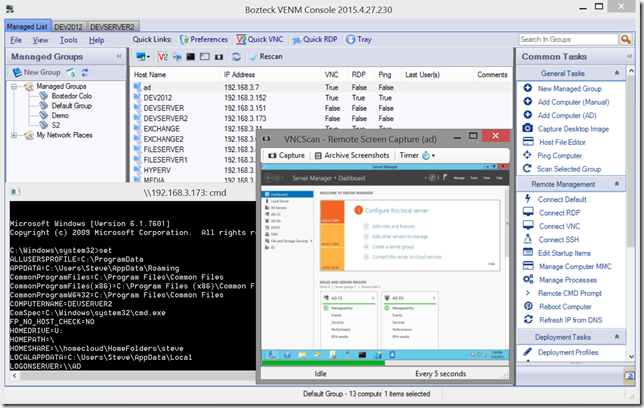 Announcing Bozteck VENM Remote Desktop manager! Way back in 1998, I wrote the first versions of VNCScan to fulfill my own need for a VNC network management tool. I named it VNCScan because, at that time, that’s all that it was designed to do. Over the past decade and a half, the product has matured and grown into a virtual Swiss army knife for IT Pro’s across the globe. Many useful non-VNC related features have been added and the focus has shifted from VNC to a fully featured remote systems management console. While the product will always support VNC and the related features around VNC, the focus for the past few years has been on Microsoft RDP, remote scripting, and the hundreds of other time saving things that you can do with the console. There have been countless instances where I have invited Network Administrators to try VNCScan and received responses like “we don’t use VNC so we won’t use it”. It is only after I have sat down with them and shown them all of the time saving and powerful functions that you can do with the product that their eyes light up and they tell me how the name does not do this tool justice! So, for this reason, we are rebranding VNCScan officially to “Bozteck VENM Remote Desktop Manager”. VENM stands for Versatile Enterprise Network Manager. Said out loud, it sounds like “venom”. Licensing will remain the same and the product keys that work with VNCScan will work with VENM. I look forward to a great future of creating new and innovative ways to make managing your servers, workstations, and devices easier. This entry was posted in Announcements and tagged bozteck, RDP, remote desktop, venm, vnc, vncscan. Bookmark the permalink.